With so many high-quality resources all over the internet, it has never been easier to learn how to program. One of the best sources of tutorials is YouTube – it offers an abundance of channels aimed at those who want to learn about coding. However, not all of these programming channels are created equal. Some are excellent for beginners and full useful tips and tricks while others may not be quite as valuable. 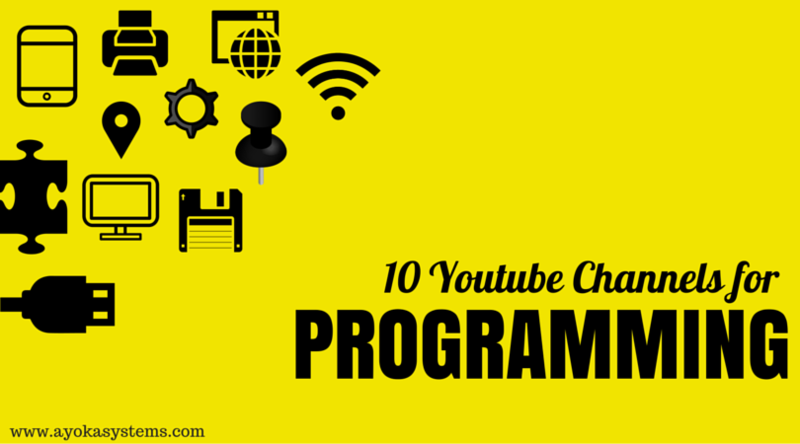 Below is a list of the 10 best channels from which to learn programming. Here you will find a variety of videos aimed at new programmers. The tutorials here range from an Android tutorial for beginners to Java, Python and C++ tutorials. Among the resources is a C programming tutorial that is considered the most comprehensive course in that language that you will find anywhere. The channel (along with ProgrammingKnowledge blog) are owned by Yogesh Patel. The sheer number of videos (over 1,000) that are geared towards beginners makes this one of the first channels that anyone who wants to get into coding should bookmark. ProgrammingKnowledge has over 150,000 subscribers. This is the official YouTube home of teamtreehouse.com. Team Treehouse is a learning resource established with the mission of providing affordable education in technology. Teamtreehouse offers lessons on numerous topics including coding in Python and C#. The videos are delivered in a casual and easy-to-understand style by a variety of presenters. The channel’s content also includes the Treehouse Show, which is a roundup of web development and programming news along with helpful tips and interviews. Treehouse has over 95 videos and more than 83,000 subscribers. On thenewboston, you will find more than 4,200 videos that are followed by over a million subscribers. TheNewBoston is arguably the single best resource for anyone who wants to become a software developer. The tutorials cover a range of different programming topics including developing for android and design. Bucky Roberts teaches the lessons using a teaching style best described as simple and entertaining. His coding tutorials are easy enough for almost anyone of any age to grasp. TheNewBoston is perfect for younger learners and for those who are completely new to programming. Kudvenkat’s video tutorials should among your main resources if you want to learn Microsoft.NET technologies. The lessons cover topics like ASP.NET along with C# and SQL Server. Kudvenkat has 13 years experience with Microsoft.NET technologies and is currently working as a software architect. This channel’s subscriber count is over 144,000 and there are more than 1,000 videos available. The tutorials are detailed and complete. DevTips will be of interest to you if you are a web designer who wants to improve your skills and if you need to learn more about coding CSS, HTML5 and other relevant topics. DevTips has over 200 videos where Google employee Travis Neilson will teach you about web design and development. At present, DevTips has more than 67,000 subscribers. You can also find interviews and lessons from guest teachers like Mackenzie Child on this channel. The primary focus of Chris Coyier’s content has been CSS and HTML and both of those topics are covered in significant detail. Other topics like PHP and Sass have been covered as well both in YouTube videos as well as on the CSS-Tricks.com website. On YouTube, CSS-Tricks has more than 23,000 subscribers and there are 220 videos available. Mike Locke is an instructor, and designer with over 17 years of experience. He specializes in front-end development (XHTML and CSS) among other areas. On YouTube, he offers a range of tutorials on topics like Adobe Illustrator also well as UX design. He has over 44,000 subscribers and more than 211 videos.